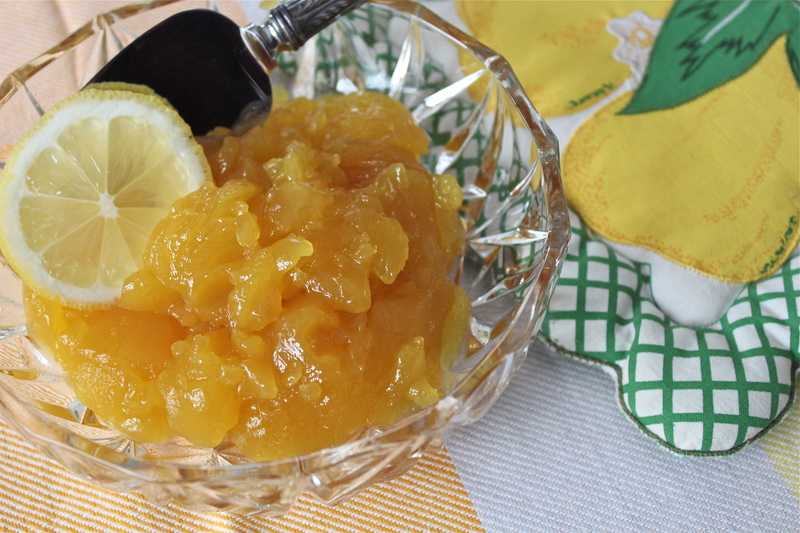 When life hands you lemons, don’t just make lemonade, make lemon curd!…. 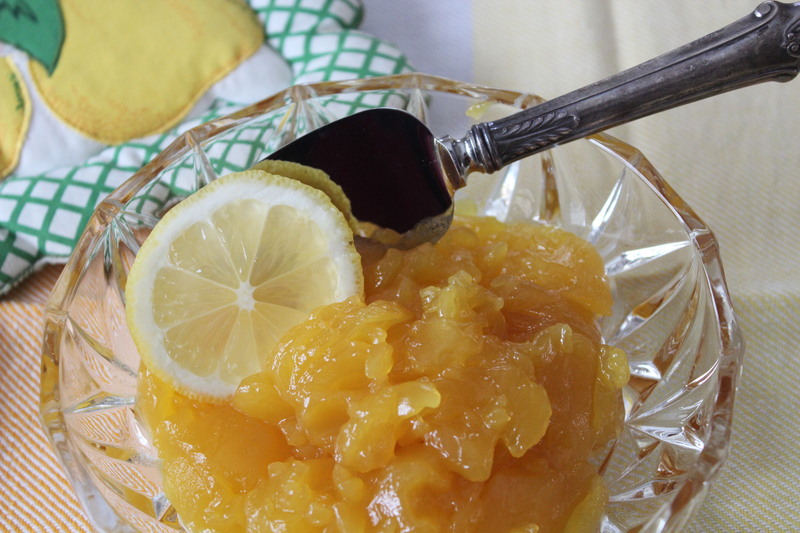 Fresh lemons are a must in this recipe and they give it unbeatable flavor. When lemons are so plentiful in the marketplace, this is the time of year to make it. 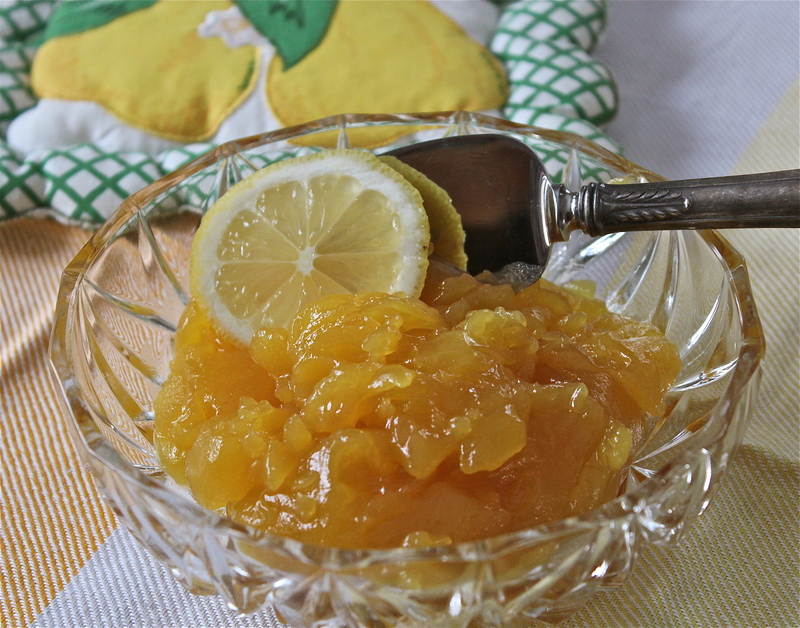 For a lime-curd variation, substitute lime rind and juice. Curd is a common tea-time treat, usually slathered on toast or scones. It is so versatile. British cooks also use it as a filling in trifles, tarts and cakes. Lemon meringue pie is, essentially, lemon curd wearing a crown of meringue. Traditionally curds are made with egg yolks and plenty of butter. This recipe uses whole eggs and cornstarch, then you stir in a couple of tablespoons of butter at the end to achieve the velvety texture expected from curd, but with less fat and fewer calories. Homemade curd will keep in the refrigerator for up to one week, you also can freeze it in a lidded container or zip-lock bag. Thaw frozen curd in the refrigerator and use it within one week of thawing. Few ingredients, but big flavor! 1. Combine sugar, cornstarch and salt in a medium heavy saucepan, stirring with a whisk. 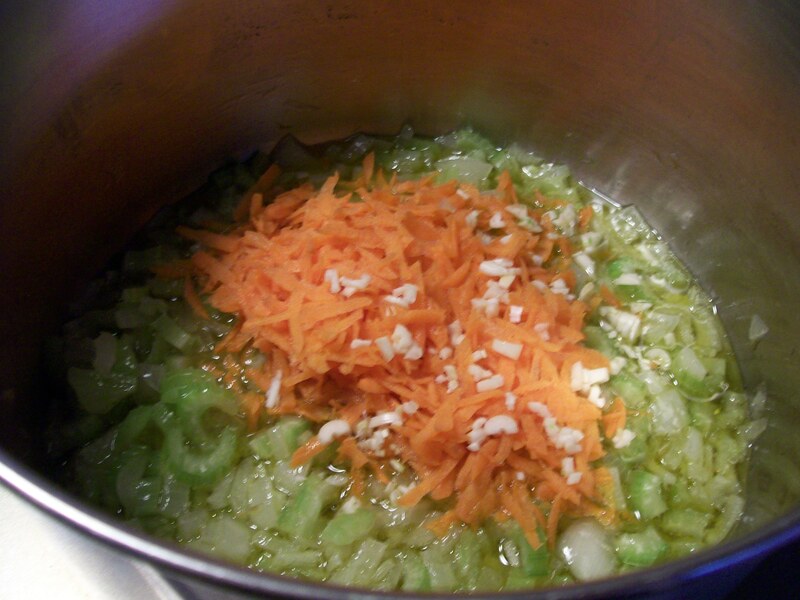 Stir in juice and eggs; bring to a boil over medium heat, stirring constantly with a whisk. 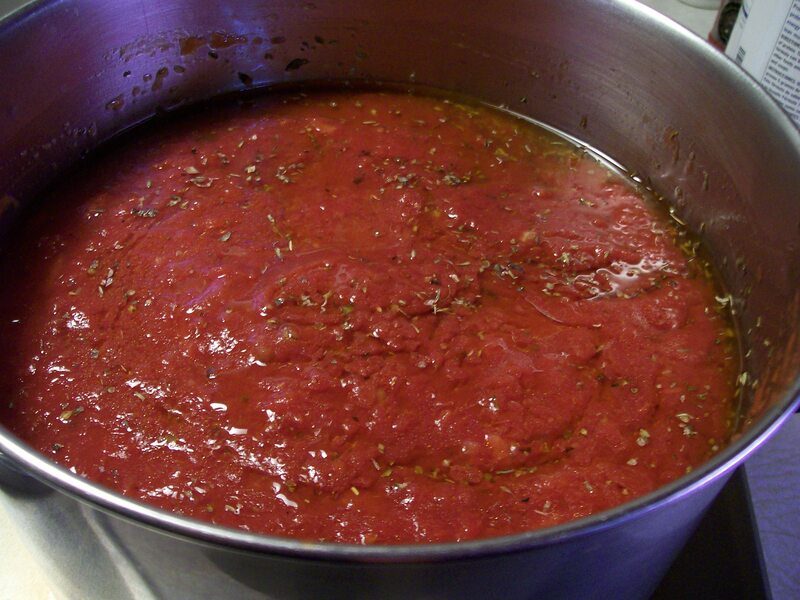 Reduce heat, and simmer 1 minute or until thick, stirring constantly. Remove from heat; add butter and lemon rind, stirring gently until butter melts. 2. Spoon mixture into a medium bowl to cool. Cover and chill at least 6 hours or overnight (mixture will thicken as it cools). I wish you could scratch and taste this picture! I had a plan in mind when I made this curd. Be sure to stop back next week to see what I did with it……. Serving size: 1 Tablespoon Calories, 35; Fat, 1 g. Carb., 6.4 g.
“Little Miss Muffet sat on a tuffet, eating her curds and whey”. Ever wonder what that nursery rhyme was all about? Well there’s no better way to explain than through the making of Ricotta Cheese. Whipping up a batch of fresh ricotta cheese gets you bragging rights and a delicious product that is free of additives,etc. 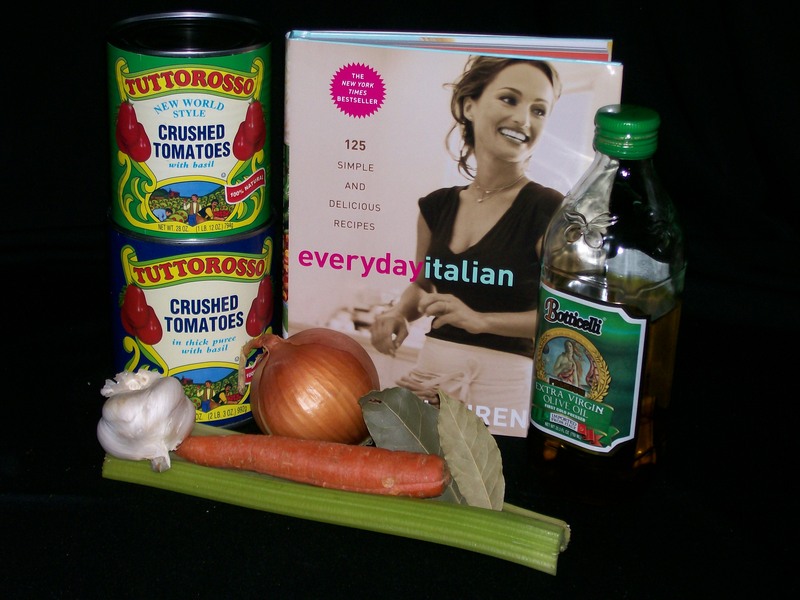 Try some with a few Italian herbs and a little olive oil mixed in and served on bruschetta. Sit back and enjoy the compliments. You deserve them! Before I get to the 1-2-3’s, let me talk a little bit about the process. Because we are making cheese, we need milk. It is best to use whole milk as it will give you a nice, rich ricotta that is smooth and creamy; not grainy like some commercial products can be. From a half-gallon of milk, you will get about two cups of cheese. Milk is made up of mostly water, with milk fat and some proteins. 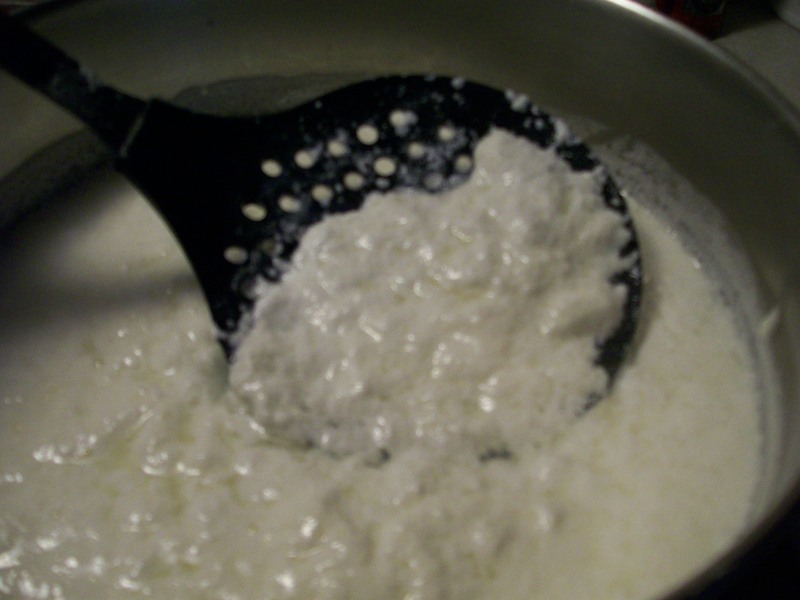 The major proteins are of two types: curds and whey. Proteins are long strands of amino acids which when exposed to heat or acid, bond to each other producing curds. The remaining liquid which is left behind is the whey. Milk can “curdle” naturally as it ages and the bacteria in it multiply causing the milk to sour. But the cheese we are making is achieved by causing the curdling intentionally by heating the milk and adding an acid. 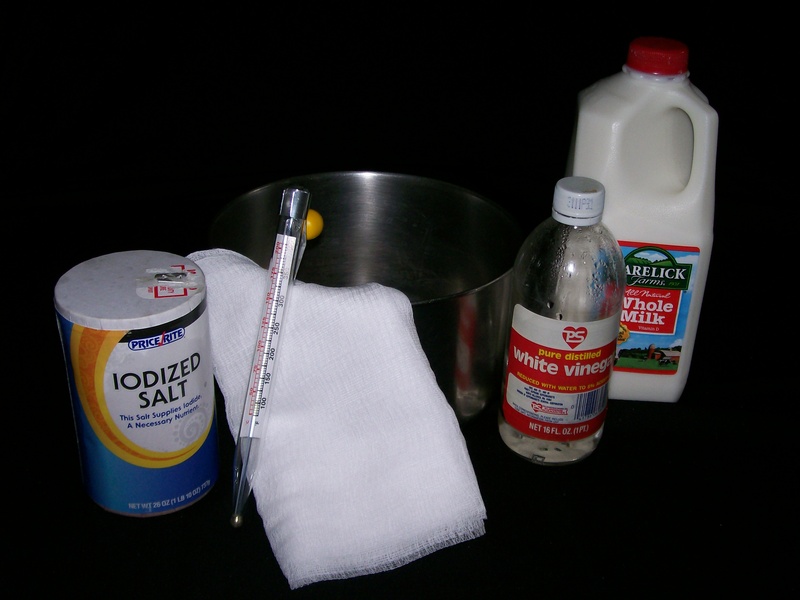 Combine the milk, vinegar and salt in the saucepan and heat to 185 degrees. Stir frequently to prevent it from scorching. As it heats, you will see the curd proteins clumping together. Once it comes to temperature, take it off the heat, and let it sit for about 10 minutes to make sure it curdles completely. Place the lined colander over a bowl to collect the whey. ( It can be used in place of milk in anything that uses milk i.e., pancakes, muffins, etc.) Pour or ladle the curds into the cheesecloth and let it drain from 5-30 minutes. A shorter drainage time will give a creamier cheese; a longer time will produce a drier more coarse cheese. Pick up the bundle and gently squeeze out remaining whey. 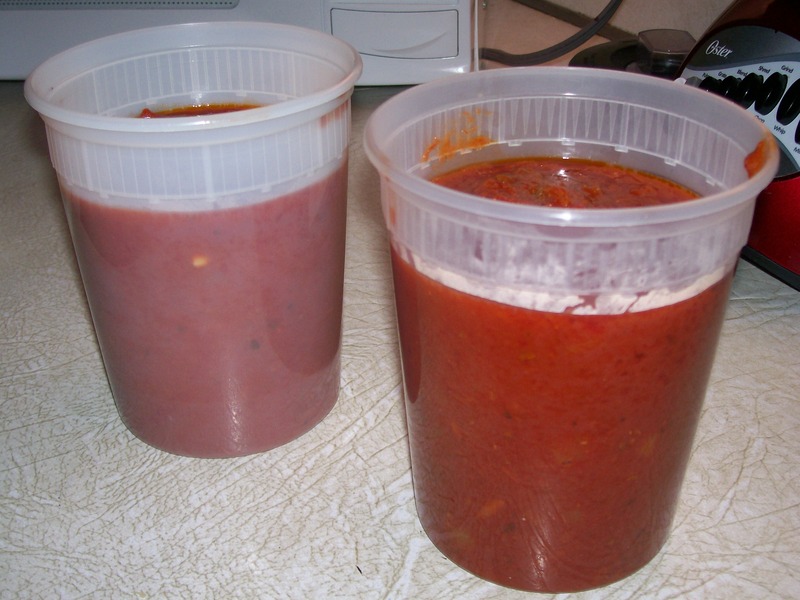 Use the cheese warm on bruschetta or pasta, or place in an airtight container and refrigerate it. It will keep for several days. I used most of mine to make Stuffed Shells with Marinara Sauce, and I will be posting the recipe for that soon. I’m sure I will be making the ricotta cheese again as I would like to try it in a cheesecake. Oh, my thoughts just went spinning off imagining it served with fresh strawberries. Yum, Yum! I’ll keep you posted.